Believing without seeing, isn’t believing blindly! Yes, Jesus did say that, but at the same time he did show his wounds to Thomas, and he did show himself to the other apostles. He appeared numerous times and one time to even 500 people at once according to the early Church creed recorded in 1 Corinthians 15. In other words, Jesus didn’t leave everyone in the 1st century doubting about why the tomb was empty. He made it known, and though he hasn’t shown himself to everyone, the recorded testimonies of the apostles always pointed to their firsthand witness of the resurrection, and the witness and knowledge of their audience. Essentially they were in the business of providing evidence to support the good news of Jesus Christ and his life, death, and resurrection. They weren’t asking people to believe “blindly” and we shouldn’t do that either. 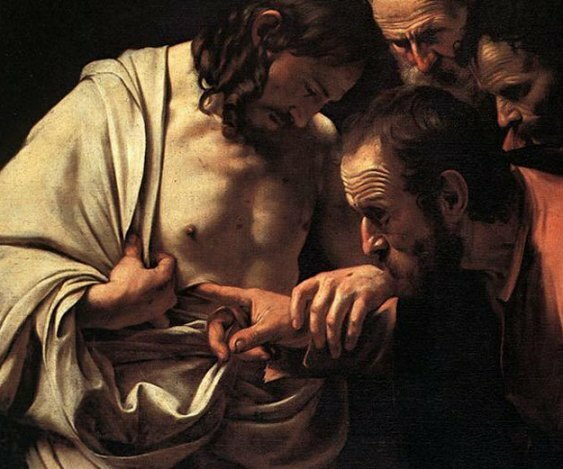 Michelangelo Merisi (or Amerighi) da Caravaggio’s painting of Jesus showing and letting Thomas touch his wounds. Previous Post Was Chiefs Player Husain Abdullah Penalized for Muslim Prayer? alegra que no seas un “gurÃº de UNIX”, porque veo que vienes usando Linux desde hace rato…. pero si te das cuenta, Windows ha hecho a la gente a no tener miedo al ordenador, imaginate si estuviÃ©ramos con una GUI en lineas de te#t8&xo230;.A lo que voy, personas que les urge la idea de montar un servidor casero [que se yo, uno de medicina] y no han estudiado redes [como precisamente te sucede a ti] le encantarÃ­a saber que hay una empresa que se empeÃ±o en ponÃ©rsela mas fÃ¡cil el asunto, y asÃ­ poder satisfacer su necesidad? o ese no es el objetivo del ordenador?